For those curious about the ambitious Project X Zone for 3DS, you can now try the game for free with the recently released "Demo A". 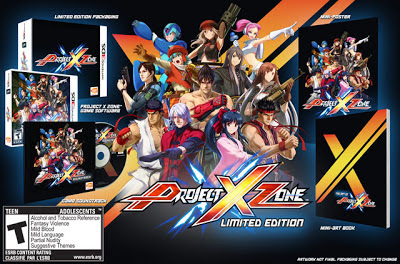 The demo features a single battle area but manages to show off the english translation, gameplay mechanics and a good variety of the crossover characters from Namco/Capcom/Sega. As the "Demo A" title implies, Namco is planning to release at least one more demo before the games release on June 25th. I highly recommend pre-ordering this game if you are interested as it will likely have a low print run and the initial "Limited Edition" includes a ton of extras including the game soundtrack, mini art book and mini poster. Enjoy!